Fresh from the show floor of Tokyo Game Show 2018, we have new details about Resident Evil 2’s dual campaigns, including how Claire and Leon’s stories will intertwine throughout. Read on for more details, including a new trailer and brand new screenshots! A little history for RE2 newcomers before we dive into things: The original Resident Evil 2 introduced a system known as “zapping” to provide an “A” story and a “B” story – two separate paths through the game that had the same major story elements for each character, but changed certain details, events, and access to items depending on which character you played as first. While this remake of Resident Evil 2 no longer uses “zapping” to tell each character’s tale, it stays true to the original by telling a unique story for each character, with both main campaigns providing a compelling point of view to provide a modern take on the story of Resident Evil 2. As both of them search for safety and survivors within the ruins of Raccoon City, fate will tear them apart just as quickly as they joined forces. 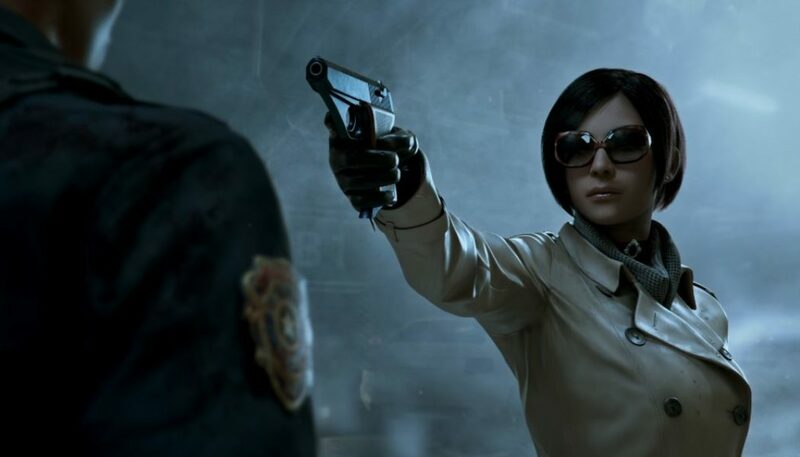 A near-fatal accident sends Claire and Leon down different paths, forcing both characters to navigate the dangers of Raccoon City, the Police Department, and beyond. If they want to live through the nightmare that begins to unfold in front of them, they’ll need to put their survival skills to the ultimate test amidst a city filled with terrifying creatures, both human and otherwise. Fans of the original Resident Evil 2 will instantly recognize certain key players in the story that have become iconic over the years. Claire will begin to uncover the sad truth of the Birkin family, guiding a young Sherry Birkin through the underbelly of the R.P.D. and the sewers that are just underneath the city in a desperate bid to escape. While the city surface is covered in the living dead, there are far worse creatures hiding in the depths. Bio weapons that want nothing more than to crush Claire are lurking in the shadows, including a terrifying, mutated monstrosity that seems to be tracking down Sherry for unexplained reasons…. Meanwhile, Leon will have his own path to explore, putting together the pieces of what happened in Raccoon City as he meets up with Marvin Branagh, Police Lieutenant and one of the only survivors of the outbreak in the R.P.D., and the mysterious Ada Wong – a woman who has her own reasons for sifting through the remains of the city. Leon’s investigation will take him far beyond the museum turned police station and into a plot far greater than he could ever have imagined. What will the rookie cop discover as he dives into the depths of the outbreak that’s consumed the city? For now, enjoy some additional screenshots below, powered by the RE Engine, bringing each character to life with stunning detail. Be sure to follow the official Resident Evil Facebook and Twitter for all the latest information on Resident Evil 2!